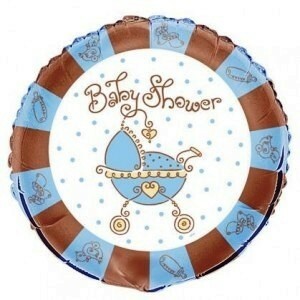 Our blue baby joy foil balloons really do add to your party atmosphere as well as making a lovely table decoration. To make an arrangement for your table or floor standing decoration, we suggest the following this idea- Inflate your foil balloon with helium together with 3 or 5 Shower My Baby latex balloons (for helium filling) in your chosen colours. Then tie the ribbons from the balloons onto themed mini favour bags (filled with sweets or dried pasta to act as a weight) or any of our cute favour boxes filled with sweets. This balloon requires helium, which you can source locally at party/balloon shops or florists.